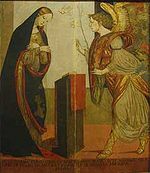 "I syng of a mayden" (sometimes titled "As Dewe in Aprille") is a Middle English lyric poem or carol of the 15th century celebrating the Annunciation and the Virgin Birth of Jesus. It has been described as one of the most admired short vernacular English poems of the late Middle Ages. Written by an anonymous hand, the text is now only to be found in the Sloane Manuscript 2593, a collection of medieval lyrics now held in the British Library, although contemporary sources suggest it was well known in its day. Originally intended to be sung, no evidence of the work's musical setting survives, and since its rediscovery and popularisation it has formed the basis for a number of modern choral and vocal works. A brain and a subtle ear has gone into the making of this poem...celebrating the mystery of Christ's conception. Dew falling on grass, flower and spray (traditional imagery, deriving from OT texts such as Psalm 72:6) suggests ease, grace and delicacy generally (not progressive stages of insemination). The emphasis on Mary's freedom of choice, at the moment of the annunciation, is theologically strictly proper. According to Miles, despite a celebratory opening, "Mary's physical stillness as proof of her virginity remains the poet's priority." As a result, the poet repeats the phrase "He cam also stylle" in three of the five verses. "Stylle" had several implications – the stillness of the conception of Mary and of the birth of Jesus Christ. The poem is written from a first person point of view, and contains five quatrains. Below is the text in both its original Middle English, with spelling intact, and a modern translation. Single surviving manuscript source of "I syng of a mayden" in the Sloane Manuscript 2593. Note how the two-verse structure in the manuscript differs from most transcribed versions. The manuscript in which the poem is found, (Sloane 2593, ff.10v-11) is held by the British Library, who date the work to c.1400 and speculate that the lyrics may have belonged to a wandering minstrel; other poems included in the manuscript include "I have a gentil cok", "Adam lay i-bowndyn" and two riddle songs – "A minstrel's begging song" and "I have a yong suster". The Chaucer scholar Joseph Glaser notes that 2593 contains the only surviving copies of several "indispensable" poems. These include the aforementioned poem "Adam lay i-bowndyn", "A Babe is born al of a may", "Benedicamus Domino" and "Lullay, myn lykyng". In 1836, Thomas Wright suggested that, although his fellow antiquarian Joseph Ritson had dated the manuscript from the reign of Henry V of England (1387–1422), he personally felt that although "its greatest antiquity must be included within the fifteenth century", some lyrics contained within may be of an earlier origin. Wright speculated, on the basis of the dialect of Middle English, that the lyrics probably originated in Warwickshire, and suggested that a number of the songs were intended for use in mystery plays. More recent analysis of the manuscript places the dialect as being of East Anglian original and more specifically Norfolk; two further carol MS from the county contain duplicates from Sloane 2593. However, "I syng of a mayden" is a unique instance of this lyric. Wel may swych a ladye Goddys modyr be. As most explicitly noted by the first quatrain, the poem was originally intended to be sung. Indeed, as noted by Stephen Medcalf, Emeritus professor at Sussex University, the text itself seems to imply melody and verse. However, due to the oral tradition of the time, the original melody of the song was not notated and over the course of time was forgotten. Since the rediscovery of the text, many composers have set the text to music, amongst them diverse choral or vocal interpretations by Martin Shaw, Patrick Hadley, Roger Quilter, John Gerrish, Gustav Holst, Arnold Bax Peter Warlock, R.R. Terry, Lennox Berkeley, Benjamin Britten ("As Dewe in Aprille" in his Ceremony of Carols), Ronald Corp (1975), Philip Lawson a setting published by Walton Music, John Adams (as the chorus "I Sing of a Maiden" in his opera-oratorio El Niño), and Bob Chilcott (in his "Salisbury Vespers"). The work is also regularly performed by the Mediaeval Baebes. ^ a b c Laura Saetveit Miles, The Annunciation as Model of Meditation: Stillness, Speech and Transformation in Middle English Drama and Lyric in Marginalia, Vol. 2 – 2004–2005 Cambridge Yearbook (Cambridge, 2005). ^ a b Michael Steffes, "As dewe in Aprylle": I syng of a mayden and the liturgy', Medium Aevum, Spring 2002. ^ Derek Pearsall, Introductory note to Chaucer to Spenser: An Anthology (Oxford: OUP, 1999) ISBN 978-0-631-19839-0, 387. ^ Laura Saetveit Miles, The Annunciation as Model of Meditation: Stillness, Speech and Transformation in Middle English Drama and Lyric in Marginalia, Vol. 2 – 2004–2005 Cambridge Yearbook (Cambridge, 2005). Appendix. ^ David Breeden, I Sing of a Maiden, Adaptations from Middle English Poetry. ^ a b Alan J. Fletcher, "I sing of a maiden": A Fifteenth Century Sermon Reminiscence" in Notes and Queries issue 223, NS 25 (Oxford: Oxford University Press, 1978). 107–8. ^ Joseph Glaser, English poetry in modern verse (Indianapolis: Hackett Publishing Co., 2007) ISBN 978-0-87220-879-7, 5. ^ Thomas Wright, Songs and carols from a manuscript in the British Museum of the fifteenth century, (London: T. Richards, 1856), 46-47, 79-80, 94-95. ^ W. W. Greg, "I Sing of a Maiden That Is Makeless" in Modern Philology, October 1909, 1. University of Chicago Press. ^ Stephen Medcalf, The Later Middle Ages (London: Methuen & Co., 1981) ISBN 978-0-416-86000-9, 14. ^ Lewis Foreman, Bax: a composer and his times, (Woodbridge: Boydell Press, 2007) ISBN 978-1-84383-209-6, 217. 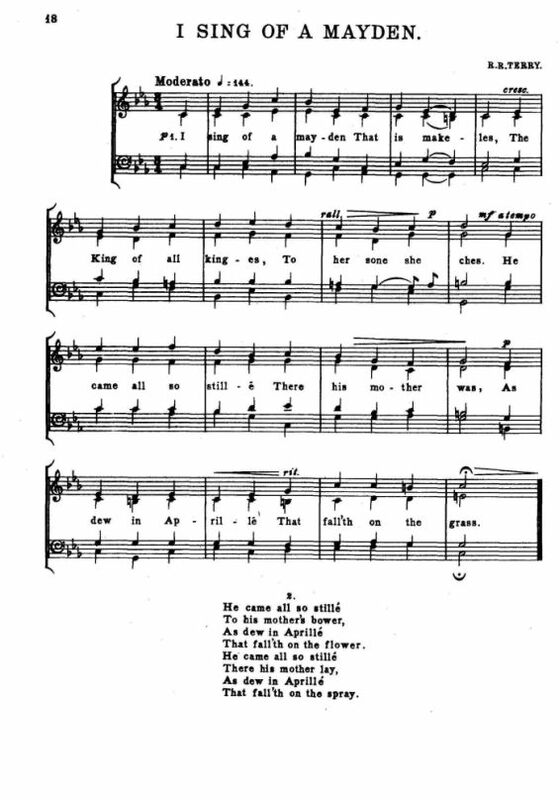 ^ Richard R. Terry, " I Sing of a Mayden" in Twelve Christmas Carols. (London: J. Curwen & Sons, 1912) 18. This page was last edited on 2 December 2018, at 22:15 (UTC).